What makes a battlefield different from any other place? Our towns, cities, fields, and parks are all potential battlefields, with lines of sight, choke-points, defensible terrain and no man’s land, all waiting to be activated. But how do you design a battlefield, balance the distribution of buildings, the flow of landscape, the arrangement of forms? It started as an investigation. I would trawl the lone map of Battlefield 1‘s open beta to try to catalog the space custom made for its warfare. Stripping the game of its HUD and dropping into match after match, I would risk the wrath of my team to wander around, looking at the layout. What I found was a surprisingly simple series of volumes, settled in a wandering landscape. The clustered houses and ruins seemed transparent—obvious high grounds and vantage points, peppered with windows for snipers to peek out of—while the sands of Sinai Desert provided little bubbles of action, separated by the peaks of dunes. Muddied with detail and complexity, these spaces took on differing atmospheres that shifted like the light over the precisely observed rocks of this arid terrain. The images I produced seem to reflect this simplicity, a quiet, composed set of shots, where landscape, sun, and shade dictate the parceling out of space. Yet, as the battles blindly raged on around me, I began to find that this carefully composed landscape underwent a transformation. The artillery liberally spaced around the map, the bombers rumbling overhead, the grenades thrown inhuman distances to land in courtyards and on rooftops began to hammer out new spaces. Frames emerge, with the shattered edges of exploded masonry at their fringes. What was an initially disappointing series of boxy volumes became a dynamic architecture, always changing as I ran for cover, finding a hole where one wasn’t before, and a wall crumbling onto me. Over the course of multiple games on the same map, the process became one of recombination: the same architecture deconstructed in different ways. As a photographer, my scope widened, each explosion a possibility, each shattered wall offering new viewpoints, new lines of sight. But there was something off about my distant examinations of space, my intention to catalog this battlefield as a series of changing sight-lines and barriers. After all, it’s the action, the event which makes a battlefield what it is. So I began to follow the combat, to track individual soldiers, ducking and circling around them to try to get the right angle for my shot. When they threw themselves into a foxhole I was there with them. When they picked off targets from a first story doorway I was beside them. When they fell I was often next. I started to build a relationship to my subjects, carefully watching their cautious paths through the battlefield, their frantic charges across the sand. And it was there that a shot suddenly emerged, one that I knew had a wider connection the moment I took it. It was a Robert Capa tribute, a pastiche of one of the most recognizable war photographs of all time. Death of a Loyalist Militiaman, taken by Robert Capa in 1936, is an infamous image. 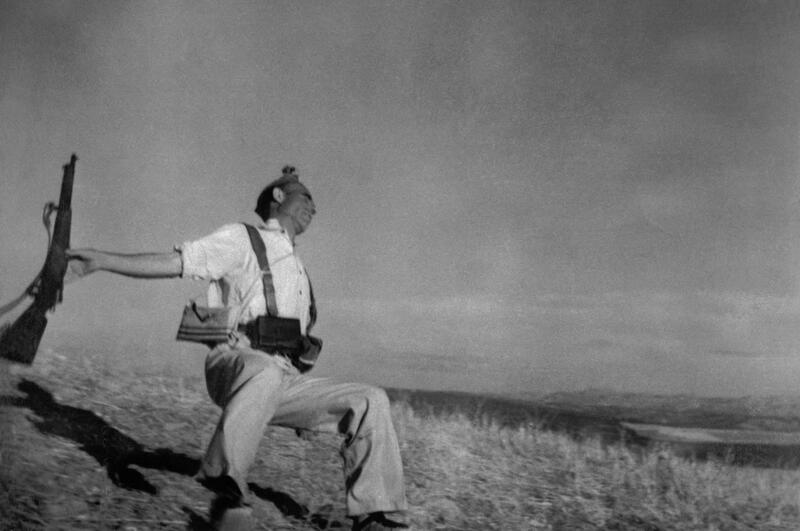 Taken during his time covering the Spanish Civil War, it shows a man at the moment of death, suspended mid-fall, his arms thrown out from his body, his gun rolling from his hand. My shot somehow mirrors that image, and yet it could not be more distant. There is no death in this image, no suffering. Only the onset of a frictionless machine of warlike imagery. Rather than confirm my experiment in war photography my accidental re-staging of Capa’s famous work seemed to question it, undermine it. In comparison to his image, mine is unreal, without real risk or drama. It is an empty copy. And yet there is a connection; the process that created the image in the first place. After all, Capa’s work is not a masterpiece of framing and carefully considered lighting: he wasn’t even looking when he took it. It is instead an image created by an embodied practice, a process of being there, at that moment, and capturing something. Most screenshots are bloodless things. They are taken using developer tools, free cameras, tweaked lighting and custom textures. Often, they are taken on unplayable versions of the game, carefully modified. Sometimes they are taken in spectator modes and then photo-shopped to appear more real, more authentic. There is nothing wrong with this, it’s just the way these images are produced. They have very little in common with the practice of shooting on a real camera. But I had no access to spectator mode, no cinematic camera. Instead, I had the ability to turn off the HUD and the ability to perform a melee attack, which, when timed correctly, cleared the screen of my characters weapon and hands. So when I took the image above my I was there, at least, as there as the soldier in front of me. I was dodging the shots that rained down from the peak of the dune, trying to line up my frame, taking cover among the sand. I had a single chance to capture this moment, a single aligned second. I am not fashioning myself as a digital Capa, or some great artist. But the process of capturing this image was something different, something new. It was something I had not experienced before in my time taking screenshots. A sense of danger (albeit imagined), a sense of capturing something dynamic, active, and a sense—one very familiar to a photographer—of a fleeting moment that, if not captured, would be hard to return to once more. Robert Capa famously said “If your photographs aren’t good enough, you’re not close enough.” Its a piece of advice I took to heart. I threw myself back into the battlefield, now seeing it as a space of potential encounters, of people play fighting, outsmarting each other, getting frustrated, getting lost, getting beaten. I didn’t try to capture what I thought a World War I photograph should look like, instead I tried to capture something particular about the strangeness of this place, where biplanes entwine with each other and fall to the ground, horses stand silently while tanks rumble past, and bodies disappear in seconds, meaning you have to be quick to catch them, or all that will be left is a helmet and a gun lying on the virtual sand of this manufactured, bizarre battlefield.